Пригожина К. Б. Efficiency of the language training course for presenting at international conferences // Молодой ученый.  2015.  №11.  С. 1459-1462.  URL https://moluch.ru/archive/91/19120/ (дата обращения: 25.04.2019). The article considers methods and techniques aimed at developing language skills and competences necessary to successfully deliver scientific presentations at international conferences. The author reasons the importance of the course, provides analysis of approaches that could contribute to the effective organization of the course. Special attention is paid to the course topics and material selection, course layout and structuring. The focus is also placed on the structure, features and content of academic scientific presentations for international conferences. Having analysedresearch work of foreign and Russian scientists on the problem, the author presents a sample of scientific presentation layout, which conforms to international academic standards. Keywords: scientific presentation; competence based approach; post-graduate (PhD) course; language teaching; English for academic purposes, structure of scientific presentations. Целью статьи является рассмотрение путей оптимизации процесса языковой подготовки аспирантов к выступлениям с научными презентациями и докладами на международных конференциях. Приводится попытка проанализировать существующие подходы к языковому обучению для указанных целей и адресата. Автор предлагает структурно-тематическое наполнение курса, отвечающее цели, задачам и выделенному на курс лимиту академических часов. На основе проведенного анализа существующих международных стандартов и требований к оформлению научной презентации дается план организации научной презентации / доклада. Ключевые слова: научная презентация; компетентностный подход; аспирантура; обучение иноязычному общению; английский язык для академических целей, структура научной презентации. University language training programmes aimed at preparing post-graduate students to participate at international conferences with scientific presentations are gaining popularity. Such courses are primarily communicative, and focus on improving language skills and main competences necessary to be able to take part in scientific debate and introduce results of scientific research work. University departments offering such language programmes to students face a number of challenges in terms of the course curriculum, content relevance, time frame, level of language command of the students. Despite high demand of such language training, number of academic hours allocated to the course programme does not seem to fully satisfy the needs of the course agenda. Therefore, designing the course we have to limit that to certain content topic areas (Pic.1). Given that post-graduate students already have language command equal B1 (CEF), the course aims at developing and improving the set of language skills necessary to perform successfully at international level in the chosen scientific field . It appears more efficient to concentrate on the structure, layout, and content elements of a scientific presentation as well as outline its differences from business (or commercial) presentations. Having analysed foreign and Russian articles on international standards to structure and layout of scientific presentations [2, 4, 5], we suggest introducing the following sample to students within the course (Pic.2). 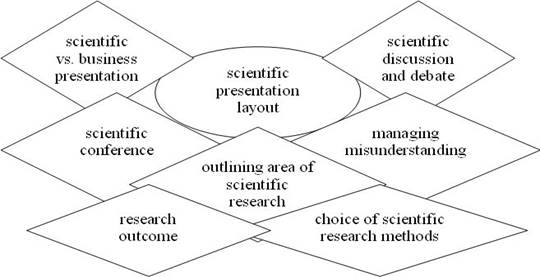 The structure and layout of a scientific presentation for international conferences corresponds to the suggested course structure. - watch a part of an academic presentation at a conference, analyse presenter’s body language and behaviour, presentation layout, use of language structures. It is also important to ensure that the tasks offered to students within the course contribute to developing their skills of critical thinking . d) analysing scientific information, describing charts and graphs, selecting appropriate research methods, stating research rationale and findings. Assessment at the end of the course is designed to check the level of development of the following competences (Table 1). Assessment procedure covers three main areas — (1) present the topic and title of their scientific research project, justify and explain the choice of scientific field; (2) deliver part of a presentation covering the introduction, aim, rationale, novelty of scientific research work; (3) deliver part of a presentation covering selected research methods, data collected, findings, implications of the scientific research work. The course final assessment is designed to check if students gained the skills enabling them to prepare a scientific presentation conforming to international standards concerning its structure and layout (see Pic.2 above). e) visuals at each part of the presentation correspond relevantly to the presenter’s speech, charts and graphs are described using appropriate language structures. To summarize, efficiency of the language training within the course to prepare for scientific presentations at international conferences depends primarily on the careful choice of topic areas to be covered, thought-out and planned course structure, selection of relevant material, designing adequate tasks and assignments aimed at developing the necessary skills and competences. Students, who successfully complete the course, show capability to participate in scientific discussions and debate, present results of their scientific research work at international conferences, communicate adequately with colleagues from different countries on the topics covering scientific and professional issues. 1. Bernatskaja M. V., Muratova O. A. (2014) [Using Critical Thinking in Language Teaching at Economic Universities]. Koncept. No 04, Available at: http://e-koncept.ru/204/14107.htm, (In Russ., abstract in Eng.). 2. Cox K., Hill D. (2011) English for Academic Purposes. Pearson Longman, 288 p.
4. Tamzen A. (2011) Cambridge English for Scientists. Cambridge: Cambridge University Press, 108p. 5. Wallwork A. (2010) English for Presentations at International Conferences. Springer publishing, 180 p.
1. Бернацкая М. В., Муратова О. А. Использование критического мышления при обучении иностранному языку студентов экономических вузов // Концепт. 2014 — No 04 (апрель) Available at: http://e-koncept.ru/204/14107.htm. 2. Cox K., Hill D. English for Academic Purposes // Pearson Longman, 2011. — 288 p.
3. Кузьменкова Ю. Б. Academic Project Presentations // Учебное пособие для студентов старших курсов и аспирантов.-3-е издание. М.: Изд-во Московского Университета, 2011. — 132 с. 4. Tamzen A. Cambridge English for Scientists // Cambridge: Cambridge University Press, 2011. — 108p. 5. Wallwork A. English for Presentations at International Conferences // Springer publishing, 2010. — 180 p.
Основные термины (генерируются автоматически): научная презентация, CEF, MSU. Научная презентация; Компетентностный подход; Аспирантура (PhD); Языковое обучение; Английский для академических целей, Структура научных презентаций. scientific presentation; competence based approach; post-graduate (PhD) course; language teaching; English for academic purposes, structure of scientific presentations. Common European Framework of Reference for Language: Learning, teaching, assessment. Council of Europe, Modern Languages Division, Strasburg, 2001. При подготовке занятия, посвященному правилам оформления презентации был использован опыт учащихся 11-х классов — победителей научно-практической конференции 2010 года (апрель). Основные термины (генерируются автоматически): URL, MIT, BBC, EXPERT, MSU, ONLINE. VI международная научная конференция «Инновационные педагогические технологии» (Казань, май 2017). Дата публикации: 02.05.2017.